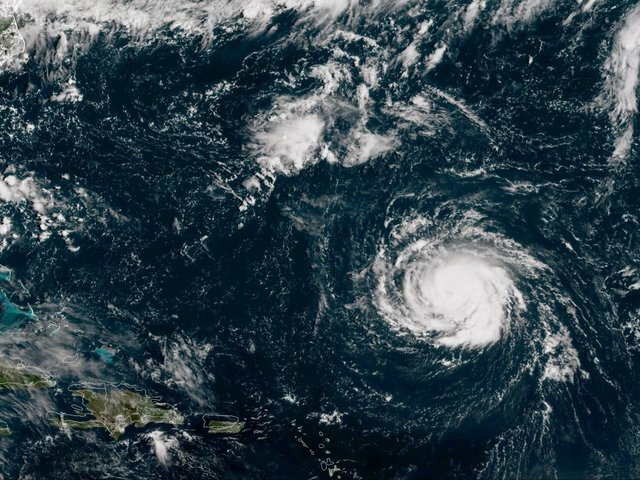 Hurricane Florence has weakened to a Category 2 storm over the Atlantic with maximum sustained winds of 110 mph -- but the size of its wind field has increased, the National Hurricane Center says. Still, some fluctuations in strength are expected through Thursday, and Florence still is expected to be "an extremely dangerous major hurricane when it nears" the US coast late Thursday and Friday, the hurricane center says. 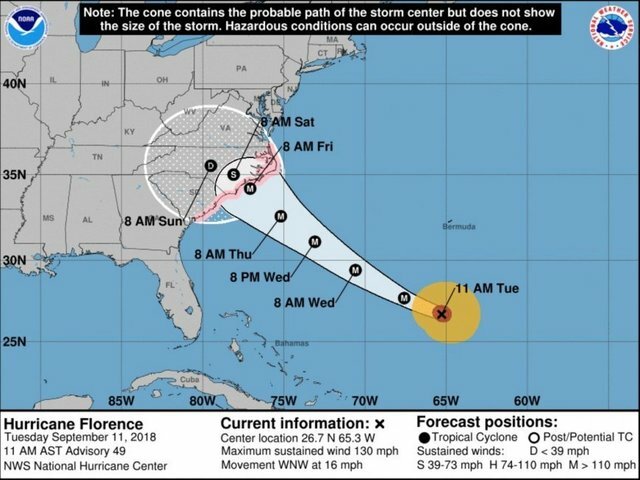 Hurricane Florence is forecast to crawl up to the North Carolina coast late this week and turn slowly left before landfall -- a development that would still smash the Tar Heel State with life-threatening storm surge, catastrophic winds and inundating rain while putting more of South Carolina in danger. "This is not going to be a glancing blow. ... This is going to be a Mike Tyson punch to the Carolina coast" from Thursday into the weekend, Federal Emergency Management Agency associate administrator Jeff Byard said Wednesday morning. "Today is the last good day to evacuate," he warned. Florence, one of the strongest storms on the Eastern Seaboard in decades , is a Category 4 hurricane with winds of 130 mph. It is predicted to deliver tropical-storm-force winds by noon Thursday to North Carolina's coast, and hurricane-force winds and dangerous storm surges by late Thursday or early Friday. Forecast models predict Florence's center may slow to a crawl just off North Carolina late Thursday or Friday and make a southern turn -- punishing the coast while moving perhaps only 2 to 3 mph -- and it may not make landfall until roughly Saturday. "More people are involved in this now, especially even Myrtle Beach, because the storm was not (previously) forecast to turn left toward you," CNN meteorologist Chad Myers said Wednesday. • The punishing crawl: Florence's predicted slow southward turn off North Carolina on Friday means some coastal areas will get damaging hurricane-force winds for more than 24 hours. "If this blows at 120 mph for four hours, ... you lose a shingle every two minutes, and all of the sudden, you've lost your whole roof after four hours," Myers said. • Rain and storm surges: Florence's circulation could bring life-threatening storm surges, up to 13 feet, to the front-right quadrant of storm -- covering much of North Carolina's coast -- and those effects also could extend to South Carolina, if the storm stalls and turns left as predicted. Up to 40 inches of rain could fall, bringing possible catastrophic flash flooding to parts of the Carolinas through early next week, with heavy rain also likely in the Appalachians and Mid-Atlantic states, the National Hurricane Center said. • Don't stare at the eye: "We can't focus on the eye on this thing, because (Florence is) 150 miles wide from one side to the other," and tropical-storm-force winds extend up to 175 miles from center, Myers said. • 'Storm of a lifetime': Florence is expected to weaken Thursday, but it's still forecast to be a dangerous hurricane as it reaches the coast. "This will likely be the storm of a lifetime for portions of the Carolina coast, and that's saying a lot given the impacts we've seen from Hurricanes Diana, Hugo, Fran, Bonnie, Floyd and Matthew," the National Weather Service in Wilmington, North Carolina , said late Tuesday. More than 1 million people are under mandatory evacuations in the Carolinas and Virginia. Hurricane and storm surge warnings are in place from South Santee River, South Carolina, to Duck, North Carolina. Hurricane warnings are issued 36 hours before tropical-storm-force winds hit the areas. Storm surge warnings indicate a danger of life-threatening inundation from rising water moving inland from the coastline during the coming 36 hours. As Florence closed in, some residents weighed whether to ride it out. In Wilmington, Richard King, 64, said Wednesday morning that he, his wife and perhaps 60 of their neighbors planned to stay. His home, built 1 mile inland in 2016, is raised 25 feet off the ground and is built to withstand 140-mph winds, he said. "We're a good community up there. We're going to stay tight and check on everybody," he said. By contrast, Allison Jones said she's not taking any chances. Her home in Hillsborough, North Carolina, is at risk for flooding, and her family and nearby relatives will ride out the storm in Chattanooga, Tennessee, she said. The five adults, six children, plus a dog and a cat planned to leave their homes Wednesday. The adults packed irreplaceable items, such as photo albums and heirlooms, while the kids stuffed their favorite toys, blankets and books into bags. "Honestly, it tears me up thinking that, What if in the end of this, this is all we have left?" Jones said. "I wish I had more time to sort through and grab more of the sentimental items." People on barrier islands or peninsulas were running out of time Wednesday to retreat by bridge or ferry. On Carolina Beach just south of Wilmington, residents were told that the one bridge connecting to the mainland will close once sustained winds reach 45 mph -- well before hurricane-force winds hit the coast. Still, officials there think about 100 people will try to ride out the storm there. And their leaders aren't happy about it. Those who stay will be on their own once the storm kicks up, said Town Manager Michael Cramer, adding that he wants those who hunker down "to give us your information on your next of kin." "Many of our emergency personnel vehicles are high-top vehicles. They have potential for rollover. ... I won't send people out to risk their lives for people who didn't heed the warnings," Cramer told CNN Wednesday morning. "They'll be there basically all alone until that threshold is met again and we have winds under that speed." Ferry service from North Carolina's Bald Head Island already has stopped -- after the last trip before the storm Wednesday morning. Susan Faulkenberry Panousis told CNN she has stayed on Bald Head during prior hurricanes -- but not this time. She packed up what she could and took a ferry Tuesday night. Residents along the coast have boarded up their homes, lined up at gas stations and emptied supermarket shelves. Some motorists near the sea may find it hard to fuel up, as gas stations close ahead of the storm. Along US 17, between Wilmington and Camp Lejeune, more gas stations were closed than not on Wednesday morning, a CNN crew there reported. In South Carolina, traffic along parts of Interstate 26 and US 501 has been directed away from the coast. Myrtle Beach Mayor Brenda Bethune took note of the forecasts' shift toward her state Wednesday and urged people to evacuate. "This is not where you want to be," Bethune said. Just outside Myrtle Beach, Christine Meinhold told CNN she was staying at her home with her seven dogs, including two she rescued from floods after Hurricane Matthew in 2016. "I really don't have the resources to evacuate" with all those animals, she told CNN. "I can't abandon them. My car has over 205,000 miles on it and won't make it far. I can't imagine breaking down somewhere and putting them in danger." The Federal Emergency Management Agency warned that storm surge watches and warnings are in effect Wednesday for the entire North Carolina coast and parts of South Carolina. It urged residents to heed evacuation orders. Florence's expanse has even captured the attention of the astronauts and cosmonauts aboard the International Space Station, who have been tweeting pictures of the storm back to Earth. In South Carolina, residents in hurricane evacuation zones had until noon Tuesday to evacuate. Gov. Henry McMaster ordered the closure of schools and state government offices for nonessential personnel in affected areas. Some schools in inland counties will be used as shelters, and officials urged families with pets to board them with veterinarians, kennels or other facilities in nonvulnerable areas. "Pets are not allowed inside Red Cross evacuation shelters," McMaster said Tuesday. North Carolina officials evacuated long-term care facilities and hundreds of prisoners in vulnerable areas, and also closed state parks, museums and other attractions. In Virginia, mandatory evacuations began Tuesday for about 245,000 residents in a portion of the Eastern Shore area. Florence could have devastating impacts in Virginia, including storm surges, inland flooding, downed trees and power outages, Gov. Ralph Northam said.